At the RSA Security Conference in San Francisco, Microsoft today said it stops one million phishing attempts every week thanks to the built-in anti-phishing protection in Internet Explorer 7 . It has just issued a patch for the web browser's anti-phishing filter. 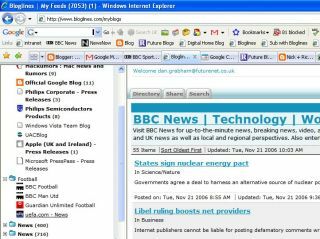 Microsoft's relatively new web browser, Internet Explorer 7, was released in October last year. Since then, its users have been prevented from visiting phishing websites more than 10 million times , Microsoft said. Every week, Microsoft or its collaboration partners add 10,000 phishing websites to its database. These records are then used to block websites when accessed in Internet Explorer 7. Microsoft also said it has tweaked Internet Explorer 7, adding a patch that will improve its web browser's anti-phishing filter. The update was made available on Microsoft's website last week, almost two weeks ahead of its next security update, scheduled for 13 February. The patch addresses a problem with navigating pages with multiple frames. Apparently Internet Explorer 7 tried to block websites using multiple frames, flagging them up as fraudulent. The patch will ensure that mutliple simultaneous evaluations are carried out on the same web page, IE program manager Steve Reynolds wrote in a IE Blog post.